My Doctor's have requested that I don't give out their information via my blog. If you need a Physician referral please visit HERE to get help from ILADS who can connect you personally to a Doctor nearby. I love to hear from readers and fellow patients! Whether its comments or questions please don't hesitate to reach out. You can email me at cskova01@ladyoflyme.com or by using the contact form below. You can also find me on Facebook, and Twitter. Response time and contact will vary due to my health, but I will make every effort to get back with you ASAP. If you’re interested in hearing more about writing inquires, interviews, collaborations, featuring your products on Lady of Lyme, or just want to say hello, please email me or go here to read more. I love to work with brands and sites big & small. Media kit is available upon request! *I do not reply to inquiries for free promotion or requests to do posts in exchange for free products. I only send out about 4-5 emails a year in my newsletter, so no worry about spam! This is NOT the same as my RSS feed which delivers new blog posts. If you are looking to share your Lyme story or would like to be interviewed I would love to have you! Guest post submissions are for original works of writing that have not yet been published online. Submissions should only be about Lyme disease, tickborne illness, or anything in that genre. Guest posts should be 300-500 words and include at least one photo. Affiliate links are not allowed. Please include a photo and a brief biography that links back to your site if you have one. Also please include any emails or social media into your post so readers can reach you. You can not buy positive reviews on my site. If you have a product that is relevant to my site, please feel free to reach out. Please note that I will only share information about products I am happy with and would purchase/use again. Shipping a product without prior approval does not necessarily guarantee a post. You have my word that I will never, and I mean never, advertise or promote anything that is inconsistent with the purpose of Lady of Lyme, even if I could make money doing it. 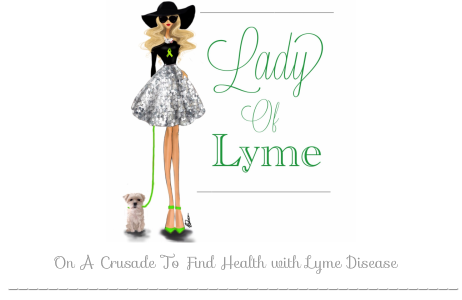 I am often contacted and asked to promote all kinds of products and services which I decline because they do not serve you, the readers, or Lady of Lyme's purpose. It is my promise to you that at NO time will you ever click a product link on my site for an item which I do not love, use and purchase myself personally. If at any time I review an item which I did not pay for myself I will clearly disclose that information in the post. Otherwise, ALL, and I mean all items and services which I discuss on this blog have been paid for by myself and are guaranteed to be things I actually use and love. My best piece of advice is to just start. Don't think too much about it at first (what your name will be, designing a site etc). Begin by putting your words onto paper (or in this case onto a blog), and the rest can come later. If you are feeling a bit shy at first set your blog to private so it can be a space only for you. When you feel ready you can change it to public and share with others. It's easy to later upgrade your blog with a domain name and site name, so I recommend leaving that worry for a later date. Yes. Since I began this journey in 2011 I have almost always been doing some form of treatment or work to get myself healthy. My treatments through the years have varied, and I discuss the main ones which worked for me here. If you visit my main blog I am constantly discussing what I am doing at present time, and if you want updates please Subscribe on my main page (right hand column). I went to college at the University of Louisville and have a Bachelor of Arts degree in Psychology, with a minor in Criminal Justice. After I graduated I continued my education (in a different direction) at FIDM, majoring in Merchandise Marketing. what co-infections do you have? Lyme Disease can cause dysfunction all across the body, and it is not uncommon for patients to have co-conditions which are created by Lyme Disease. In my case I have Postural Orthostatic Tachycardia Syndrome (POTS), Hashimotos and Graves Disease, Multiple Chemical Sensitivities (MCS), and Crohn's Disease. I also struggle with Mast Cell issues, and Food Allergies/Sensitivities. Diet can be tricky, and it's going to be different for everyone. I stick to an anti-inflammatory diet which is often called the Lyme Diet. My restrictions have switched a lot throughout the years but I have always been Gluten and Soy free. You can read more about the Lyme Diet here.